REDWOOD CITY, Calif., Jan. 14, 2019 /PRNewswire/ -- Equinix, Inc. (Nasdaq: EQIX), the global interconnection and data center company, today announced the expansion of its global footprint to South Korea with its new International Business Exchange™ (IBX®) data center in Seoul. This carrier-neutral data center—called SL1—will provide interconnection and colocation services to businesses in support of their digital transformation initiatives and adoption of cloud. The new SL1 IBX data center will provide more than 18,000 square feet (approximately 1,680 square meters) of colocation space, offering an initial capacity of 550 cabinets in the first phase, and is scheduled to open in Q3 2019. South Korea is one of the top 15 largest economies in the world and one of the most vibrant digital economies globally—with high bandwidth and advanced applications driving many of its industries. It also ranks second globally for its focus on Information and Communication Technologies (ICT), making it a key market for many of today's global enterprises. It has a high broadband penetration rate, with numerous internet service providers (ISP) that require carrier-neutral data centers for their interconnection needs. By entering this new market, Equinix will help our global customers expand into South Korea, while helping local companies across the enterprise, service provider, cloud and content spaces accelerate their digital transformation initiatives via Platform Equinix®. The expansion into South Korea coincides with the impending nationwide launch of 5G networks in March 2019. The introduction of 5G will usher in a new era of next-generation services and breakthroughs in industries such as Internet of Things (IoT) and Artificial Intelligence (AI) that will require data transactions at higher speeds and volumes, with lower latencies. With data expected to continue to grow exponentially, the need for data centers that are able to meet the demands of businesses through colocation or interconnection services will be further amplified. This market expansion is significant to Equinix as it supports the company's ongoing global expansion and strengthens its leadership position in the Asia-Pacific region. The launch of the SL1 IBX data center will expand the company's Asia-Pacific coverage, enabling customers to securely deploy their infrastructure, reach global ecosystem partners and scale their businesses at the digital edge. Over the past three years, Equinix has invested more than $800 million to organically build and expand its presence in the Asia-Pacific region. These IBX facilities are built on Platform Equinix, which is comprised of 200 IBX data centers across 52 markets and 24 countries, providing data center and interconnection services for more than 9,800 of the world's leading businesses. Equinix currently has 40 IBX data centers across 12 markets in Asia-Pacific. 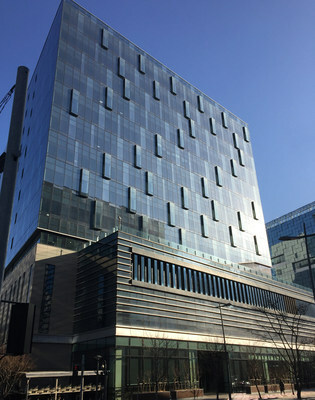 The new addition to Platform Equinix will be located at Sangam, known as Digital Media City, near Seoul's central business district, and offer an initial capacity of 550 cabinets. Currently, Equinix provides customers with access to more than 1,800 networks and over 2,900 cloud, IT and system integrator services globally. This strategic expansion to Seoul will help address the rising demand for carrier-neutral, network-dense data center services from companies in South Korea. The expansion will also support the rapidly increasing private exchange of data between businesses—also known as interconnection. According to the second volume of the Global Interconnection Index, a market study published by Equinix, Interconnection Bandwidth capacity in Asia-Pacific—a measurement of direct and private data exchange between businesses—is expected to grow at a 51% compound annual growth rate (CAGR) from 2017 to 2021, contributing more than 27% of Interconnection Bandwidth globally. Designed for global and local businesses that require network and ecosystem density, the SL1 IBX data center will offer a wide range of connectivity options, including cross connects, Equinix Connect, Equinix Internet Exchange and Equinix Cloud Exchange Fabric™ (ECX Fabric™), providing businesses with secure and direct connections to their customers, partners and the world's leading services providers. With ECX Fabric, Equinix customers can discover and dynamically connect to any other customer and partner through an easy-to-use portal and a single connection to the Equinix platform. This will include direct and secure connectivity to a wide array of network service providers as well as cloud and IT service providers globally. "We are delighted that Equinix is extending its global footprint to our native country with a presence in Seoul, South Korea. Based on our great experience working with Equinix in the global market, we believe this expansion will have a truly positive impact, enabling us and other local companies to interconnect with other markets regionally and globally, and enjoy greater scalability to meet the changing needs of businesses in today's fast-paced economy." "Equinix's announcement of a new data center in South Korea strengthens its place as a major data center player in Asia-Pacific. This expansion represents the next step in the company's global build out of its colocation and interconnectivity footprint to strategic cities and the edge. The new data center will be of particular interest to global customers with interests in South Korea as well as local enterprises seeking to connect with a global digital ecosystem beyond South Korea's borders." "Seoul, the fourth-largest metropolitan economy globally, is an important connection point for both regional and global businesses, and we are excited to expand our global platform to this new metro in South Korea. Our operations will enable customers to securely deploy their infrastructure, reach global ecosystem partners and scale their businesses at the digital edge, all within our carrier-neutral IBX data centers that are managed with global standards of operational excellence. We look forward to helping our global customers expand into this key market, while also helping South Korean companies accelerate their digital transformation initiatives via Platform Equinix." "As one of the most innovative and technologically advanced countries in the world, South Korea is forging ahead in the Fourth Industrial Revolution. The rapid digital transformation taking place across businesses and industries will soon be underpinned by next-generation technologies such as 5G and AI, that require data centers that are flexible and agile to keep up. We look forward to working with Samsung SDS, a competitive cloud service provider with a strong foothold in this market, to play a key role in supporting South Korea in sustaining its technology and industrial leadership on the global stage." Equinix, Inc. (Nasdaq: EQIX) connects the world's leading businesses to their customers, employees and partners inside the most-interconnected data centers. In 52 markets across five continents, Equinix is where companies come together to realize new opportunities and accelerate their business, IT and cloud strategies. Equinix.com. This press release contains forward-looking statements which are based on current expectations, forecasts and assumptions that involve risks and uncertainties that could cause actual results to differ materially from expectations discussed in such forward-looking statements. Factors that might cause such differences include, but are not limited to, unanticipated costs or difficulties relating to the integration of companies or new ventures we have acquired or will acquire into the Equinix platform; unanticipated costs or difficulties relating to expansion into new markets; the challenges of acquiring, operating and constructing IBX data centers and developing, deploying and delivering Equinix services; a failure to receive significant revenue from customers in recently built out or acquired data centers; failure to complete any financing arrangements contemplated from time to time; competition from existing and new competitors; the ability to generate sufficient cash flow or otherwise obtain funds to repay new or outstanding indebtedness; the loss or decline in business from our key customers; and other risks described from time to time in Equinix filings with the Securities and Exchange Commission. In particular, see recent Equinix quarterly and annual reports filed with the Securities and Exchange Commission, copies of which are available upon request from Equinix. Equinix does not assume any obligation to update the forward-looking information contained in this press release.